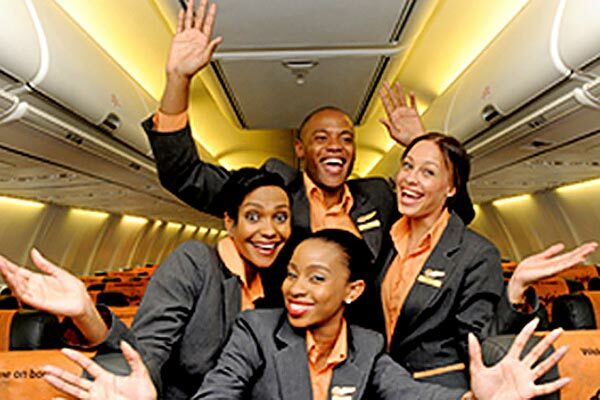 Mango flight launched as South Africa’s first low-cost airline on the 15th of November 2006. It is owned by South African Airways, the country’s largest air travel provider. Mango flights are popular with South African travellers as well as visitors from abroad who require comfortable and affordable domestic flights at competitive prices. You may see Mango flight also referred to as Fly Mango, Flymango.com or simply FlyMango. Mango recently upgraded their seating to offer Guests more legroom. Mango Airlines are continually offering cheaper flights and launching specials that appeal to many travellers, making it a popular choice of airlines for any budget conscious traveller. 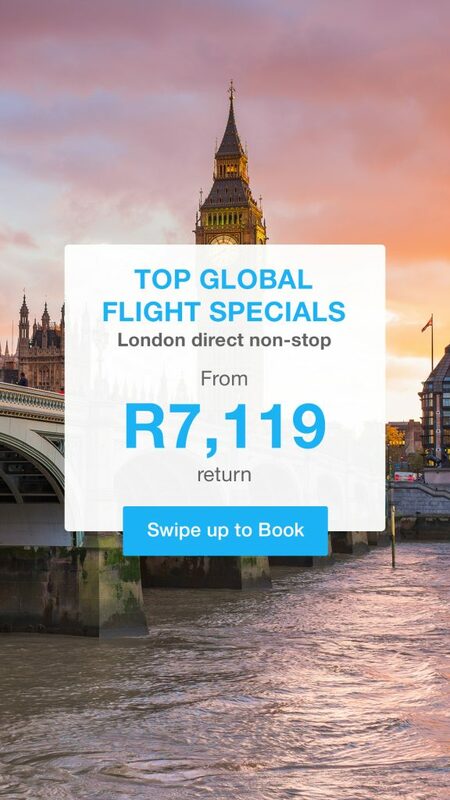 Popular past specials include the “R1 Fare” and more recently, the “Happy Days Sale” which was an overwhelming success. The popularity of Mango Airline bookings, or Mango Airways is attributed to its continual efforts to ensure that the people of South Africa, across every cultural and economic demographic, have access to airline travel. Mango Airlines offers you a simple experience of air travel, and an airline ticket to one of the many destinations on our airline routes. Simply put, a Mango Airline ticket offers affordability and access to our many domestic flights. Our passengers can catch a Mango Airlines flight to Cape Town to visit family or make those important business trip flights to Johannesburg, without worrying about flight prices. Mango Airline’s most competitive pricing on the domestic flights, also extends across major airline routes. This makes frequent business travel on FlyMango between Cape Town and Johannesburg or Johannesburg to Durban, for example, a most convenient and affordable airline option. Step 1: Scroll up to Domestic Flights South Africa’s flight finder tool at the top of this window. Step 2: Click in the ‘From field’ to start typing in your desired departure location and click on the correct auto complete suggestion that pops up. Do the same in the ‘to’ field. Step 3: Click on the dates listed under ‘Depart date’ and ‘Return date’ to bring up a calendar and scroll to your desired month. Click to select your preferred date. Step 4: Select from the drop-down lists beneath these fields the number of adults who will be flying and the number of teens (12 to 15 years), children (2 to 11 years) or infants (under 2 years) that will be accompanying you. Step 5: Click ‘search’ to see available flights and choose the Mango flight days and times that suit you using the radio buttons next to the corresponding results. This will add each leg to your cart automatically. Then simply follow the prompts to complete your Mango airlines booking. 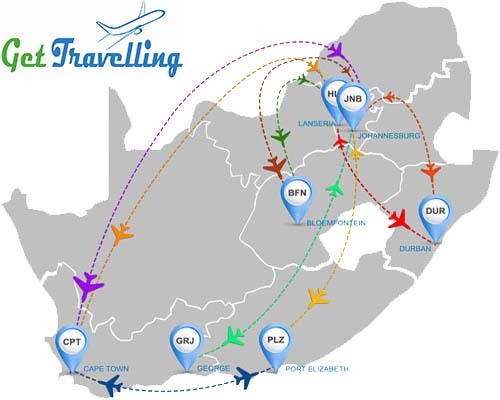 Mango offers flights departing from seven South African airports. 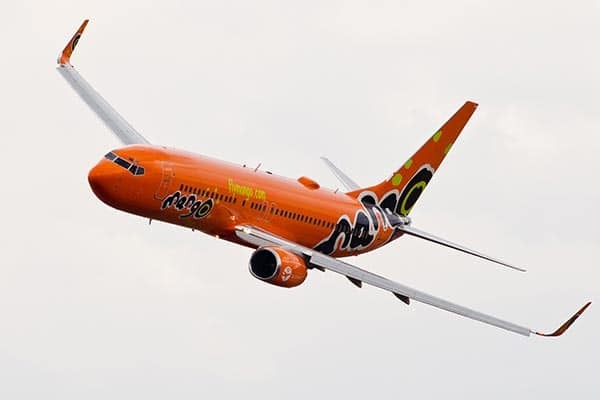 Wherever you go you will see the big bright ‘orange bird’ landing or taking off from all of South Africa’s major airports. These Mango flights are ferrying people to the bright lights of the City of Gold, the Cape Winelands, or to dip their feet in the warm ocean after a flight to Durban, or holidaying in the friendly city of Port Elizabeth. There is always a Mango flight that will get you there. We also fly to George and Bloemfontein, and offer two flights weekly to the popular island honeymoon destination of Zanzibar. Not exceed one bag at 7 kg’s. In addition to carry-on baggage, you may carry aboard a handbag and overcoat whilst guests with infants seated on their laps, may also carry a small bag catering for the in-flight needs of the infant (i.e. feeding bottles, nappies and medication). You must not include in your baggage toy guns, cutlery, knives, scissors, syringes, blades, nail clippers or other sharp objects that appears to be/could be used as weapons. Failure to adhere to the Carry-on baggage restrictions is in violation of CAT-OPS-121 Civil Aviations If your baggage is lost or damaged, please notify a Mango representative at the airport. To ensure you have a pleasurable and safe flight, new baggage allowances were implemented early this year. Economy class travellers are allowed one single item weighing up to 7kg with dimensions of 36x23x56cm, additionally you may take a handbag or slim-line laptop bag. However, if you miscalculated and your carry-on baggage exceeds the above weights or dimensions, don’t stress as you can have them checked-in. With customer satisfaction being a must, flymango is the only domestic airline allowing passengers to take one or more item of checked-in luggage with a combined total weight of up to 20kgs. For your convenience you can utilise the check-in counters for your flights located in the airport’s domestic terminal or simply check-in online. At the same time, you can reserve your preferred seat. If you purchased your ticket more than a day before your flight, you can make use of the Mango mobi-app. Please note that the mobi-app is not available to passengers flying from Bloemfontein or George, or to and from Zanzibar. Passengers travelling to these destinations need to check-in online or at the check-in counters. Passengers who purchased their ticket with a credit card must have the same credit card with them when checking-in. Passengers requiring assistance or those with children under the age of 16 years will not be allocated seating in the emergency exit row. Enter your identification details in the required fields and click ‘identify’. Complete the process and select your seats from available open spots. NB: You must present the credit card used to make your booking at the boarding gate, unless you have a TMS travel card. Being unable to do so will prevent you from boarding your Mango flight. Special allowance is made on all Mango flights for registered service or guide-dogs. The animals may travel with their owners in the cabin, free of charge but must be secured with a suitable safety harness. Mango Airlines does need you to be able to provide irrefutable proof that you are unable to travel without your supportive pet, though. So remember to get this documentation from a registered source before booking your flight. Pre-booking the animal on the flight is essential and must be done by contacting the Mango flights call-centre on 086 100 1234. For pets travelling in the cargo hold, pre-booking is also essential, as the cargo hold space is limited to only two pet containers per flight. Payment for your pet must be made at the airport and remember to have up-to-date vaccination and health certificates documentation with you. Your container must be leak-proof and made with fibreglass, polyethylene or metal. The container together with your pet, must not weigh more than 32kgs and should meet all obligatory government requirements for humane and safe transportation. Food, snacks and refreshments are available for purchase on all Mango flights. Passengers who just want a snack whilst enjoying the view from above have a variety of items to choose from. The Flymango menu varies throughout the day, and they have a delicious and nutritious special menu for young travellers. In order to retain low-cost airfares Mango don’t cater for special dietary requirements, but they certainly don’t mind if you bring along your own snacks that better suit your preferences. An excellent range of cold beverages is available comprising but not limited to, wines, ciders, beers and spirits including hot beverages of tea, coffee or hot chocolate, as well as a variety of sodas and juices. Mango PLUS guests are given a voucher to the value of R50 that can be exchanged for anything on the onboard menu. Mango Airlines frequent flyers Travel Management System Aware of the complications that can often arise when juggling numerous business flights, Mango Airlines devised the Travel Management System (TMS) to help companies arrange flights in the most cost effective and convenient manner. This includes the often unforeseen need to alter flight times and dates. The TMS allows people booking numerous flights, to have access to all available fares, be able to manage flight reservations, save time having to input data of frequent flyers, and avoid the need to present a credit card at check-in, by using a corporate travel card. The Mango TMS has been an extremely time and cost effective tool for many corporate travellers. Mango are receiving 2 new B737-800s in August 2013, which will be fitted with a new seating arrangement, offering between 6 & 7.5cm additional legroom. The seats also weigh less, and the design allows the same density of seats currently offered. 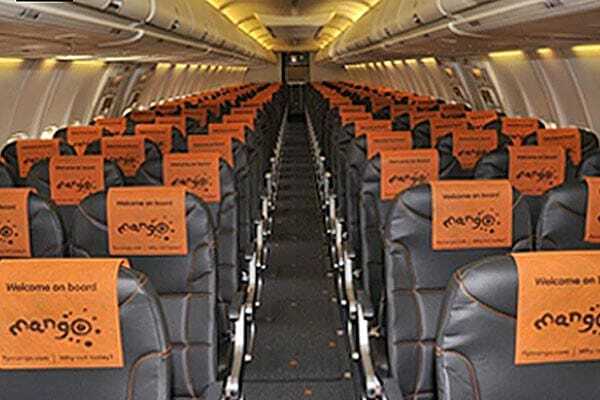 Up to April 2014, Mango are going to be working on replacing their entire fleet’s seats with the new seats. Mango Airlines leases six B737-800 aircraft from its parent company, South African Airways (South African Airways, in turn, leases the aircraft from a leasing company, Gecas, which owns the aircraft). One of the Mango planes has had Brother International branding on it since January 2013. Mango’s fleet consists of 10 Boeing jets: 1 Boeing 737-300 and 9 Boeing 737-800s. The Boeing 737-300 seats 142 passengers, while the 800 seats 186. When you need to get somewhere fast with excellent service at an affordable price, your only answer is a ‘no frills’ Flymango flight in one of their Boeing 737-800s. You can save time and conveniently book your ticket at Shoprite or Checkers and if you don’t have a credit card, utilise your Edgars charge card. You won’t experience unnecessary delays at the airport because this airline has, for the last six years in South Africa, been the most timeous! Mango PLUS and FLEX clients may, with no additional charge, change their scheduled flight. Your cheap Mango flight will leave you feeling more than impressed with the latest addition of added leg-space and superb service. While you’re comfortably seated use every moment to catch up with business by connecting to the in-flight Wi-Fi service with a choice of either 30Mb for R29 or 60Mb for R49! Beneficial for the larger passenger requiring two adjoining seats for more comfort, two seats may be purchased with each seat being paid for. When paying for your Mango flight with SAA Voyager Miles no additional benefits related to SAA Voyager Miles will be applicable such as upgrades, extra baggage or use of lounges. Standard terms and conditions for SAA Voyager and Mango are applicable. Making your cheap air flight simpler is a Mango Voucher that can be utilised as an alternative form of payment for your base fare not including airport taxes or any additional extras. Mango is the only airline allowing payments via store charge cards. Travellers using their Edcon Thank U Account cards will incur a service fee on the card, but have the choice of repayment instalments and if their ticket is paid for within six months, no interest is charged. Note this method is not applicable for booking flights that are departing within two days. Mango’s partnership with Nedbank allows Nedbank’s clients to redeem their Nedbank Greenback points that may be used to pay in full their base fare or in part, excluding taxes and extras, with the outstanding amount being paid by credit card. With the partnership between AMEX (American Express) and Mango, travellers can claim their membership rewards via AMEX for a voucher and pay for their base fare, excluding taxes and extras. Should the base fare total more than the voucher, the balance must be paid by credit card. If your vouchers value is more than the cost for your base fare, you’ll be issued with a new voucher for the difference. Mango Airlines was this year listed in the top ten ranking of ‘Travelmath’ as one of the global leaders in low-cost air travel besides being voted the ‘coolest’ low-cost airline in South Africa in the ‘Sunday Times Generation Next Awards’. It also celebrated flying in excess of six million passengers to and from the mother of all cities, Cape Town including five years flying from Lanseria Airport.